Note from the author: I hope you find the following interesting. I've trawled through a lot of stuff and brought it together especially for this site, in a fashion that I've not found anywhere else. I've tried to pick out horse related information from research that has been done on various animals, including humans. Coat pigmentation is determined by the presence, absence or relative proportions of the melanin pigments eumelanin and phaeomelanin. The melanins are high molecular weight (i.e. relatively large), light absorbing biopolymers that occur in various similar forms. Eumelanin is either brown or black in color, but is thought to always be black in horses. Phaeomelanin is either a reddish or yellowish brown. Light absorption by melanins causes skin, hair and eye colors which, biologically speaking, are important for camouflage and display. 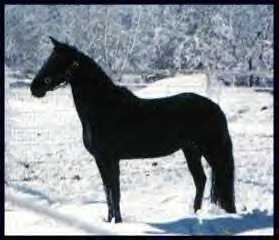 Melanins also function to protect against the sun and are involved in thermoregulation (black horses, for example, are more common in breeds of colder countries). They seem to help protect the body against some harmful chemicals, including free radicals and might also have anti-melanoma properties (Riley, 1997). Melanins are produced in cells which are, appropriately enough, called melanocytes. Proteins called enzymes convert the raw materials in the melanocytes into melanin pigment. The enzymes can therefore be thought of as the proteins that are actively involved in the biochemical processes of the body: they do a job rather than being structural. The raw materials include chemicals called indoles, along with other products derived from the oxidation of tyrosine. The biosynthesis of melanins (melanogenesis) is illustrated in figure 1. Use the link if you want to open this diagram in a new page, to refer to during your reading. It used to be thought that after the first two steps (in which L-tyrosine is converted to dihydroxyphenylalanine (DOPA) and then dopaquinone) melanin biosynthesis could proceed spontaneously. Tyrosinase was therefore thought to be the only essential enzyme in the biosynthesis of melanin (Hearing and Tsukamoto, 1991). However it is now known that other enzymes are involved at various stages of melanogenesis. Some of these enzymes probably have other jobs in addition to their roles in melanin production (Oetting et al, Tabibian, 2001). Tyrosinase is involved in at least three stages of melanin production and is therefore an important enzyme in the process. The tyrosinase gene is most probably the ancestral gene from which genes for similar enzymes have been derived by mutation: the gene is part of a family of at least three homologous (genetically similar) genes (King et al, 1995). 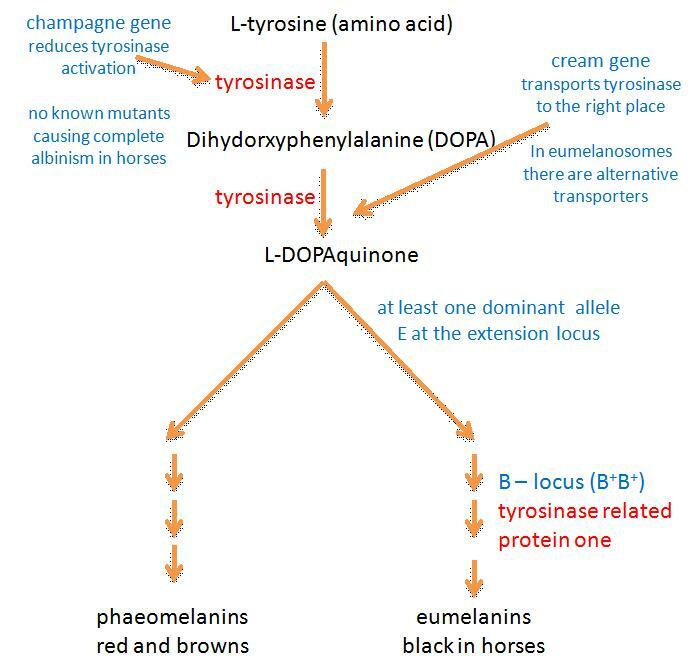 Besides tyrosinase, the family contains DHICA oxidase (encoded by the B locus) and dopachrome tautomerase (I don’t think that mutations at this locus have been identified in horses). DHICA oxidase is discussed later. The quantity of melanin produced is proportional to the amount of tyrosinase activity present in the cell. Defects in this enzyme cause albinism in various mammals, including humans (Koybayashi et al, 1994, Oetting, 2000) and mice (Kwon et al, 1987). True albinism has never been found in horses and perhaps this enzyme is so crucial to a horses’ biochemistry that it can not survive without it. In humans, and probably in horses too, black skin has up to ten times more tyrosinase activity and melanin than white (or pink) skin. It used to be thought tyrosinase might be encoded by the C-locus (Bowling and Ruvinsky, 2000), as it is mice and humans (Kwon et al, 1987). 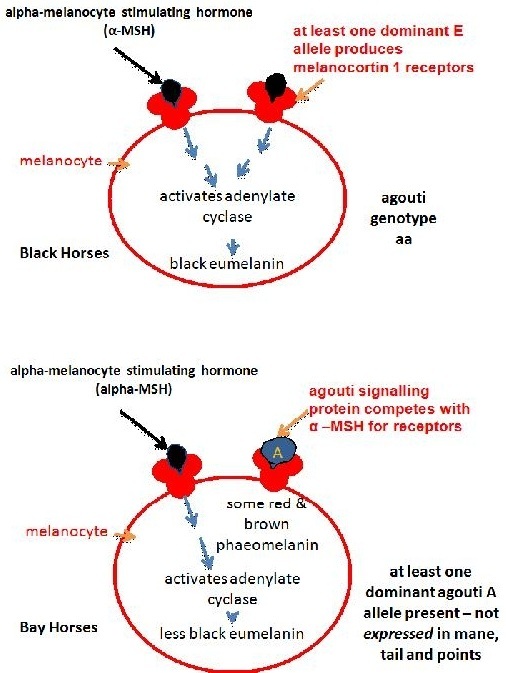 In horses this locus includes the cream dilution allele CCr, which affects phaeomelanin pigment particularly and has only a slight affect on eumelanin. The reader who looks at figure 1 will realise then that the C locus in horses is an unlikely candidate for the tyrosinase gene: if this were the case then you’d expect black pigment to be at least equally affected by the CCr allele. Mariat et al (2003) showed that the cream allele in the horse is actually a mutant form of the membrane associated transport protein (MATP) gene, which is the equivalent of the underwhite (uw) mutation in mice (cream is discussed further below). It is possible that one of the other coat dilutions was in some way due to reduced tyrosinase activity. Both black and red pigments are diluted by the action of the dun dilution. Nevertheless, dun is caused by an uneven distribution of pigment granules in the hair shafts that is most probably isn’t associated with a mutation in the tyrosinase protein. I note, however, that champagne causes a dilution of all coat pigments and gives a pink skin and paler (but not pink or blue) eyes. One could imagine that this could conceivably be due to reduced tyrosinase activity causing reduced pigment in the skin, coat and eyes. Maybe it is the champagne gene rather than the cream gene that is actually homologous to the mouse and human C genes. The B, or brown, locus codes for an enzyme called tyrosine related protein-1 (TRP-1; Koybayashi et al, 1994). TRP-1 causes the oxidation of 5,6-dihydroxyindole-2-carboxylic acid (DHICA) – which is brown - to black carboxylated indole-quinone, a biochemical step near the end eumelanin production (Olivares et al, 2001). TRP-1 is therefore also known as DHICA oxidase. In mice, after which the brown locus is named, TRP-1 mutants lack DHICA oxidase activity, and are therefore brown. It is now thought that such mutants don’t occur in horses and that only black eumelanin is produced. It isn’t clear what enzymes, if any, convert indole 5,6-quinone to eumelanin. One assumes that either this form of eumelanin is also black, or that this pathway is blocked in horses (if anyone has information on this it’ll be gratefully received!). The extension locus encodes a receptor molecule called the melanocortin 1 receptor (MC1R) that occurs on the surface of the melanocyte. The switch between eumelanin and phaeomelanin production is regulated by the interaction of the MC1R with either alpha-melanocyte stimulating hormone (alpha-MSH) or the agouti signalling protein (encoded by the agouti locus). Binding of alpha-MSH results in a complex and not fully understood molecular signalling that stimulates eumelanin production (Zalfa et al, 2001, Jung et al, 2001). Evidence from research in other mammals suggests that the recessive alleles of the extension locus (e and ea) may produce a receptor that is uncoupled from this signalling process (Zalfa et al, 2001). This would explain why the E locus is epistatic to both the B and A loci: horses of genotype ee, eea and eaea are chestnut regardless of their genotype at the other two loci (see the diagram below). On the other hand heterozygous horses with one E+ allele produce enough wild type receptor molecules for the production of at least some eumelanin. Phaeomelanin production requires the sulfhydryl compounds cysteine or glutathione dopaquinone to be present (Oetting et al, Tabibian, 2001). The agouti gene controls a switch from normal eumelanin production to a reddish (or sometimes yellowish) form of phaeomelanin in the body of the horse, but not in the mane, tail and points (lower legs and ear rims). As mentioned above the agouti signalling protein produced by this gene competes with alpha-MSH for the melanocortin 1 receptor produced by the extension locus. Research in other mammals suggests that binding of the agouti signalling protein blocks the signalling process that leads to eumelanin production (Zalfa et al, 2001). This is similar to what happens for chestnut colour only in this case the binding disrupts the receptor, while in chestnuts the receptor is itself altered. In chestnuts eumelanin production is stopped altogether, while alleles of the agouti locus reduce eumelanin production to some degree (depending on the allele) and only in some areas of the body. The recessive black allele Aa has been found to have an 11 base pair deletion causing its loss of function, so that the signalling process isn’t blocked and eumelanin is produced throughout the body (Rieder et al, 2001). 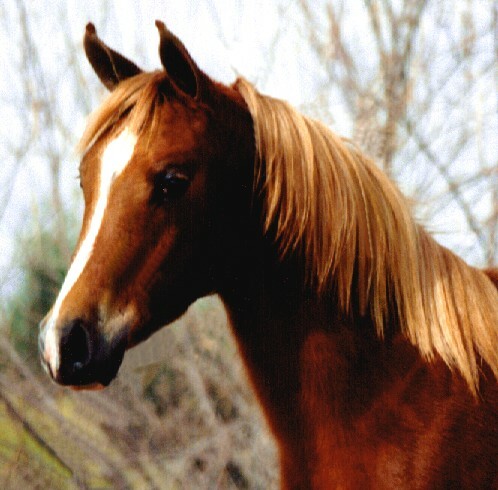 Some horse coat colors and patterns are not due to differences in the melanin biosynthetic pathways. Rather they are caused by differences in the ways the pigments are distributed, either to different parts of the hair shafts (as in some dilutions) or to different parts of the body (as in patterned horses such as paints and appaloosas). The distribution of pigments is also partially under genetic control and some genes involved have been identified. 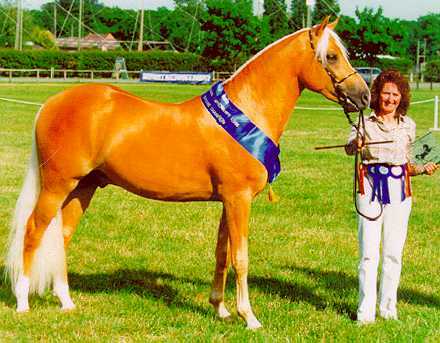 In horses the cream and overo genes were recently identified. As commented above the cream allele in the horse is a mutant form of the membrane associated transport protein (MATP) gene (Mariat et al, 2003). This is the equivalent of the underwhite (uw) gene in mice (Du and Fisher, 2002) and a gene that causes albinism in humans (Newton et al, 2001). Graf et al. (2005) also demonstrated that MATP polymorphisms (variations) were associated with normal variation in human pigmentation. MATP protein transports other molecules across melanocyte membranes, including, but not exclusively, tyrosinase. Melanocytes of mice with the underwhite mutation are markedly different from wild-type melanocytes. 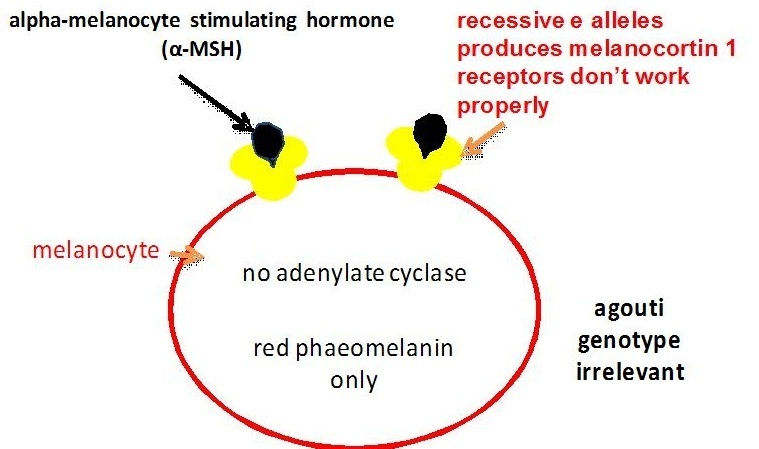 Tyrosinase processing and transport to the melanosomes (the intracellular organelles where melanin production takes place) is disrupted and the enzyme is abnormally secreted from the cell. This disrupts the normal maturation process of these organelles (Costin et al, 2003). Normal levels of tyrosinase are produced but only part of it is delivered and active in the right place for melanin biosynthesis, resulting in reduced pigment production. Why this affects phaeomelanin production so much more than eumelanin production isn’t entirely clear. However it is known that the melanosomes where the two types of pigment are produced are structurally and bio-chemically different. Certainly eumelanin melanosomes have another (and possibly similar) transport protein called p protein, which doesn’t occur in phaeomelanin melanosomes. Perhaps melanosomes producing phaeomelanin have more MATP protein in their membrane, instead of p protein. However this is pure conjecture on my part and perhaps there’s another reason altogether. I will keep an eye out for any emerging answer. Melanocytes originate in the neural crest region of a developing foetus and migrate throughout the foetus during its development. The migration pattern is genetically controlled and can result in some dramatic coat patterns, such as that seen on the zebra. It would also appear to affect the coat pattern known as overo. 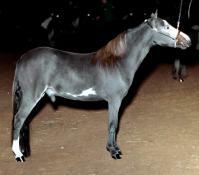 Overo paint horses are heterozygous for the overo allele (Oo). Homozygous foals (OoOo) are all-white with blue eyes and die of complications from intestinal tract abnormalities. These all-white foals lack both pigmentation and nerve cells in the intestinal tract (aganglionosis). Ganglia (nerve cells) are also migratory cells that originate in the neural crest region. The overo gene is for the endotheline-B receptor (Metalinos et al). It would seem that this is involved with both the migration of pigment and nerve cells. Bowling, A.T. and Ruvinsky, A. 2000. The genetics of the horse. CABI publishing. Gi-Dong Jung, Jeong-Yeh Yang, Eun-Sup Song and Jin-Woo Park. 2001. Stimulation of melanogenesis by glycyrrhizin in B16 melanoma cells. Experimental and Molecular Medicine 33(3), 131-135. Ito, Shosuke & Wakamatsu, Kazumasa. 2003. Quantitative Analysis of Eumelanin and Pheomelanin in Humans, Mice, and Other Animals: a Comparative Review. Pigment Cell Research16 (5), 523-531. King, R.A., Hearing, V.J., Creel, D.J. and Oetting, W.S. 1995. Albinism, in The Metabolic and Molecular Basis of Inherited Disease. (Editors: Scriver, CR, Beaudet, A.L., Sly, W.S. and Valle, D.). McDraw-Hill Inc. pp. 4353-4392. Kwon, B.S., Haq, A.K., Pomeranzt, S.H. and Halaban, R. 1987. Isolation and sequence of a cDNA clone for human tyrosinase that maps at the mouse c-albino locus. Proceedings of the National Academy of Sciences. 84, 7473-7477. Manickam Sugumaran. 2002. Comparative Biochemistry of Eumelanogenesis and the Protective Roles of Phenoloxidase and Melanin in Insects. Pigment Cell Research 15 (1) 2-9. Mariat, Denis, Taourit, Sead and Guérin, Gérard. 2003. 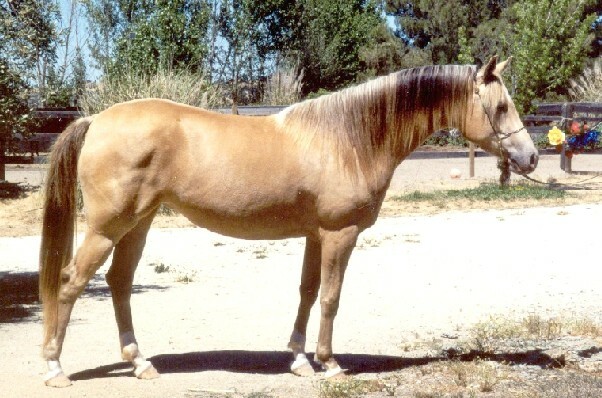 A mutation in the MATP gene causes the cream coat colour in the horse. Genet. Sel. Evol. 35, 119-133. Marklund L, Moller MJ, Sandberg K, Andersson L. 1996. A missense mutation in the gene for melanocyte-stimulating hormone receptor (MC1R) is associated with the chestnut coat color in horses. Mamm. Genome 7, 895-899. Oetting, William S., King, Richard A. and Brilliant, Murray H. The Clinical Spectrum of Albinism in Humans. Online at http://albinism.med.umn.edu/mmm.htm. (Accessed on 20/12/05). Oetting, William S . 2000. The tyrosinase gene and oculocutaneous albinism type I (OCA1): a model for understanding the molecular biology of melanin formation. Pigment Cell Research 13, 320-325. Stefan Rieder, Sead Taourit, Denis Mariat, Bertrand Langlois, Gérard Guérin. 2001. Mutations in the agouti (ASIP), the extension (MC1R), and the brown (TYRP1) loci and their association to coat color phenotypes in horses (Equus caballus). Mammalian Genome 12 (6), 450 – 455. Tabibian, Michael P. 2001. Skin Lightening/Depigmenting Agents. eMedicine online at http://www.emedicine.com/derm/topic528.htm. (Accessed on 20/12/05). Wagner, HJ and Reissmann, M. 2000. New polymorphism detected in the horse MCR1 gene.Animal Genetics 31, 289-290.